Sherry FitzGerald brings to the market this truly impressive detached family residence at Cois Cuian, Baile Liam, An Spideal, for sale by private treaty. 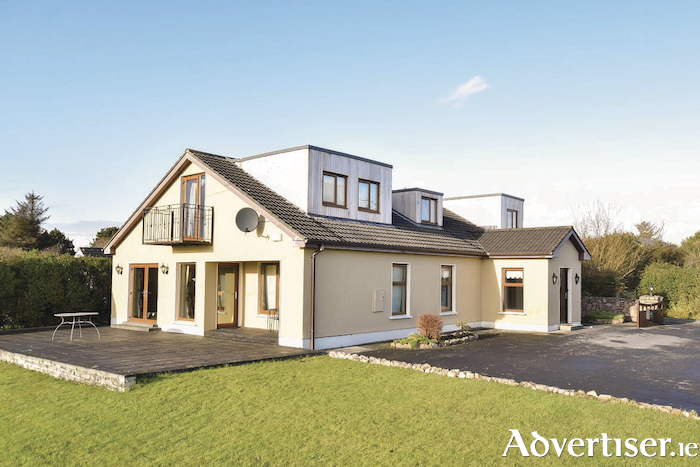 The property is situated on a mature elevated site offering wonderful views of Galway Bay. This residence offers generous accommodation throughout and is presented to a very high standard by its current owner. The property has an abundance of natural light flowing throughout with the added advantage of scenic views of Galway Bay with the Clare hills forming a beautiful backdrop. Spiddal is a popular and expanding Gaeltacht seaside village. It is located approximately 18km from Galway city with an array of shops and services on offer as well as both primary and secondary schools in the village. Cois Cuain is within walking distance, approximately 1km (0.6mile ) from the village along a quiet cul-de-sac just off Baile Liam road. Asking price is €395,000. The living accommodation on the ground floor is well proportioned with large front facing windows capturing views of the established gardens together with Galway Bay. The main living areas, together with the master bedroom on the first floor level, are all south facing, enjoying maximum daylight. There are dual patio doors leading to a large paved patio area from the kitchen/dining room which is perfect for entertaining. All bedrooms are well proportioned, bright, and airy. The thermal efficiency of the house has been improved over the years with extra insulation added to the cavity walls and roof. There is a zoned wood pellet central heating system. The BER is C1. The care and attention given to the residence extends to the gardens, with sweeping lawn areas and well maintained flowerbeds with established shrubs, trees, and hedgerows. The garden is south facing and very private. The property also benefits from a separate block garage. In all, this is a very fine, well fitted, family home close to Spiddal village and overlooking Galway Bay on an elevated site.